To my dear followers and all of you who might find this blog. 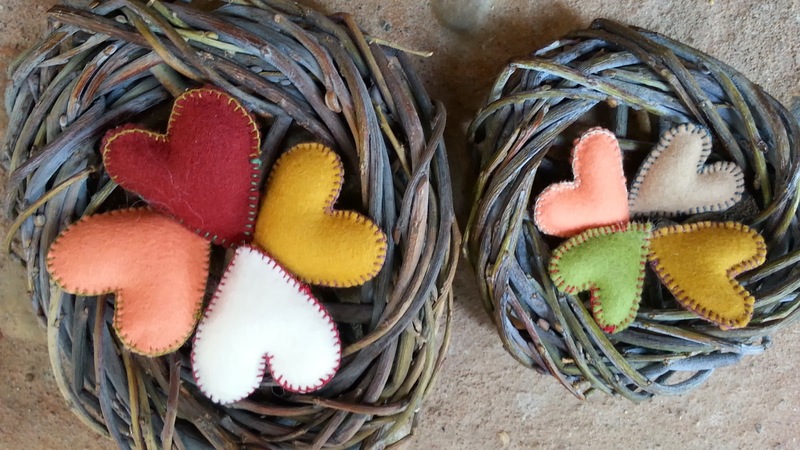 I have moved it to a new location, and under a new name: Life, Radically Homemade. 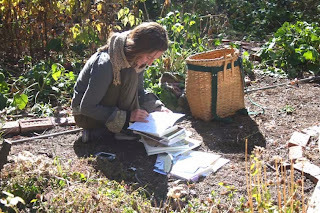 I invite you to visit me there, and sign up if you wish to follow stories from the permaculture homestead. My voice and writing will be enriched by posts from my husband, permaculture teacher and world traveler, Scott Pittman. 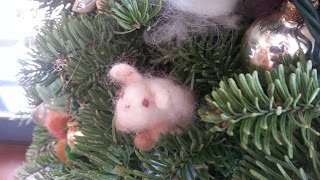 See you at the new blog! 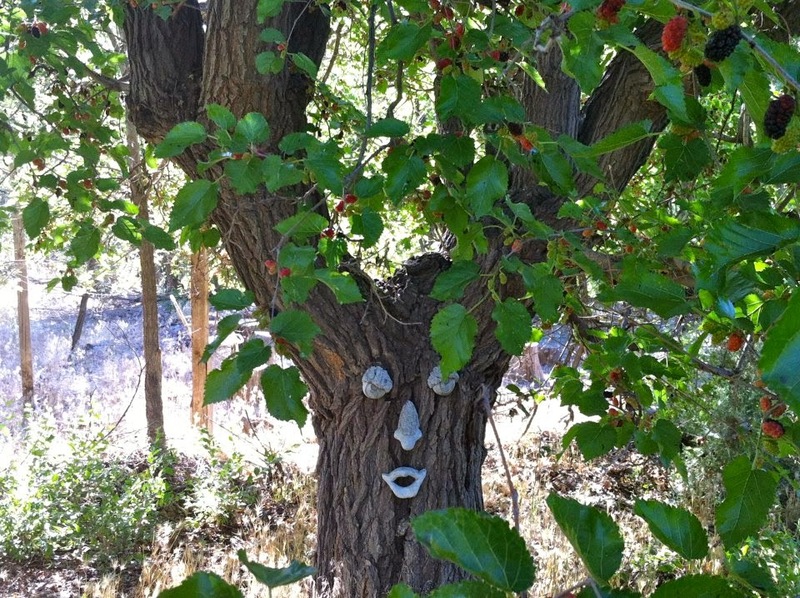 On the short list of favorite trees to use in permaculture - Mulberry. Handsome and fast growing, drought resistant even in our dry climate (7"/ 18cm of rain annually), with large canopy that cast much needed shade - this tree also have a lot to offer to critters, birds and people. There are two chicken flocks at our permaculture farm right now. The egg layers and the meat breed chicks live separately, their life paths and destinies diverging. The egg layers are free ranging, while the meat-breed chicks are raised on a diverse pasture, roaming free over a large piece of land, but enclosed none-the-less. Chickens are easy to raise, if you have some spare space and good protection from predators. 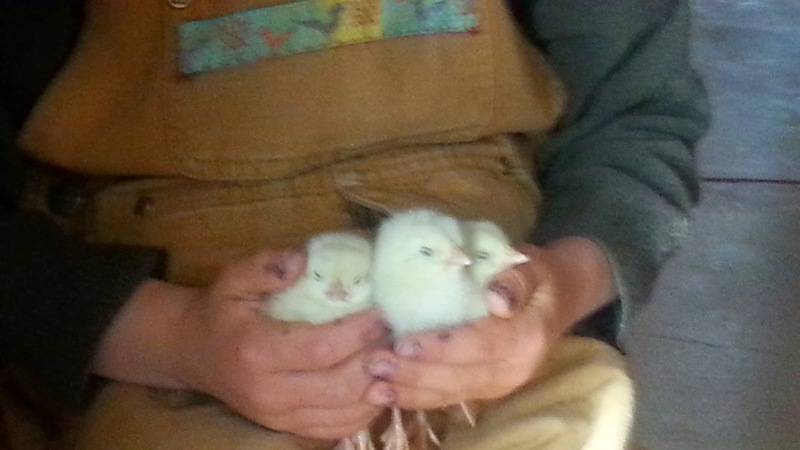 It all begun with little baby chicks arriving via mail order from our local Privett Hatchery. The mail carrier called us to announce that she was delivering the little peeps, to be sure someone would be at home, so they would be received and taken care of immediately. Fifty little chicks, each size of a tennis ball, occupied the box, hatchery-born, unaware of the existence of a mother hen, or green grass, or any part of the big wide world. At our permaculture farm, we are always searching for ways to reduce our ecological footprint - and our dependence on ecological wealth located outside of our bio-region. 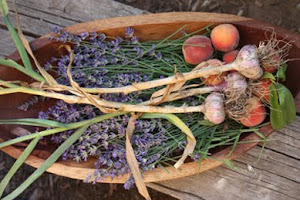 Our gardens provide us with bounty of foods, through the seasons. 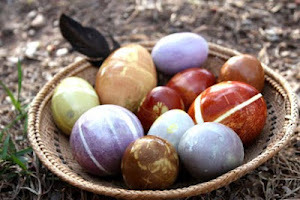 And growing our own raw milk, eggs and meat is another step that makes a lot of sense to us, ecologically speaking. And so meat chicks are here, to be humanely raised and ethically harvested, and to provide us with food that is local and ecologically raised. For some weeks the peeps were kept in a nursery, a room in the chicken house where they had warm water and protection from the wind, cold and predators. 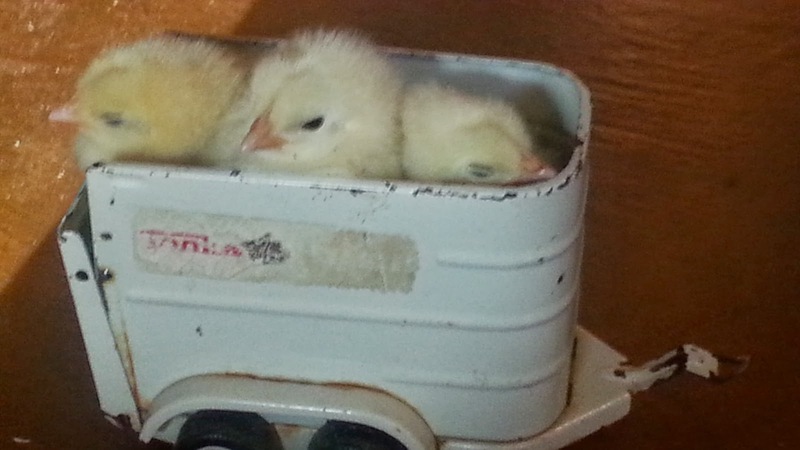 Lacking a mother hen to keep them warm, the chicks spent most of their time under a heating lamp. Once their first feathers appeared, and the spring weather became a bit warmer, it was safe to move them outside. It was really time for some life-giving sunshine and a healthy snack of grass, too! Our chicken house is located at a distance of about 60 feet away from the nearest grassy area. So the question of transportation was to be resolved. Two-week old chicks are too young to understand who to follow - or why. 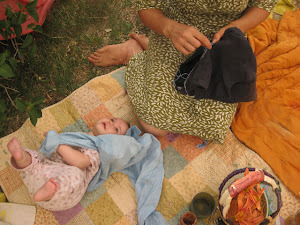 Had they have a mother, they would easily navigate with her help. But raised under a heat lamp, such chicks are basically little orphans, and don't have any instructions provided to them as to where to go and what to do. Turning them loose would result in fatalities due to many dangers that await baby chicks in life - barn cats, other chickens, dishes of water in which to drown, and obstacles behind which to get stuck and lost. In addition, ravens and magpies predate on baby chicks in day hours. Without a mother, babies must be protected at all times. Enter the chicken tractor - a tight and light enclosure (a large rectangular box wrapped into wire), their destination for the next few weeks. But how do we get them there? 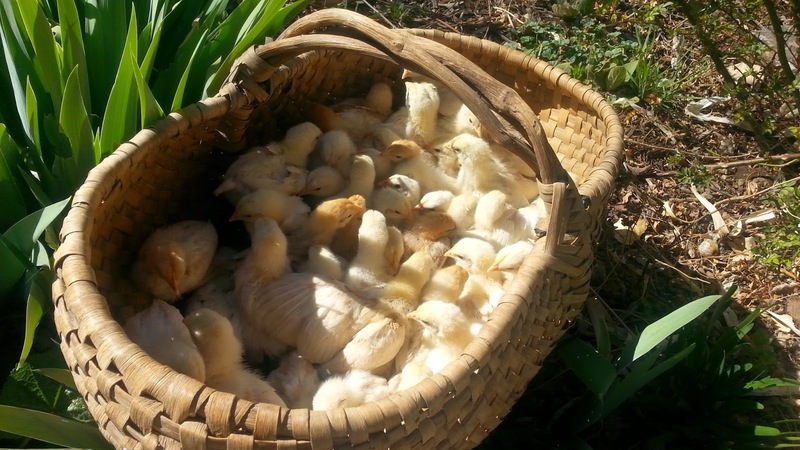 Chicks entered the world in style - hand-picked individually (50 times) and placed in a large Haitian market basket (that is a whole other story) - and then carried out and to the grassy area near the coop. And here the chicken tractor awaits, safe haven for grazing and sun-bathing.The entertainment factor of a chicken tractor is high, and the chicks are irresistible for all who walks nearby, drawing lots of attention and admiration. Eventually a few escape, after finding a low spot that created a tunnel of sorts - and our own dog, the little fluffy dear creature, killed 5 of them within minutes. Dog on the leash detention, chicken tractor repositioned, and the life goes on. Chicks are getting bigger, fast. They are harder and harder to catch twice per day, and the nights are still too cold to leave them outside. Plus it is dangerous. Luckily, things evolve on their own sometimes. Chicks outgrow the little chicken tractor in about 2 weeks, but they also fledge out and thus are ready to face the elements. They also develop some intellect and learn to run towards humans, as they figure out that humans bring their food and water. That means they are ready to follow! That means, they could be lead places. And here comes their big promotion - a very large (and thus unwieldy) chicken tractor #2, located in the fenced goat pasture. 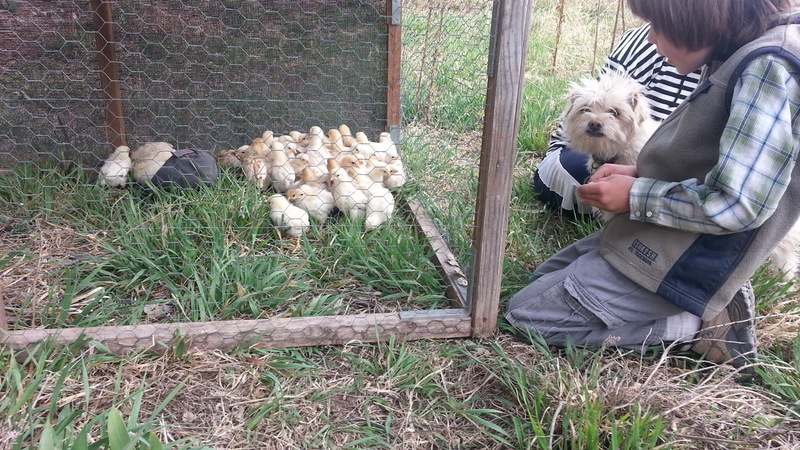 As ravens and hawks watch from nearby trees, we release the chicks from their little nursery chicken tractor. One of us is equipped with a feeder, and a song of "Chip-chip-chip-chip" that works as a call out, gently leading the chicks to their new location, about 100' away. The other person observes and walks behind the chicks, assisting any that are confused. The flock quickly forms and follows the lead person, racing forward. All are in within a few minutes, 100% success rate. The door of the chicken tractor is closed and new chapter begins. The birds sleep outdoors. Their night-time protection from coyotes, racoons, skunks and others is a duty assigned to our Great Pyreneese dog. The dog has no idea what is expected of him, but looks and acts like he knows his business. 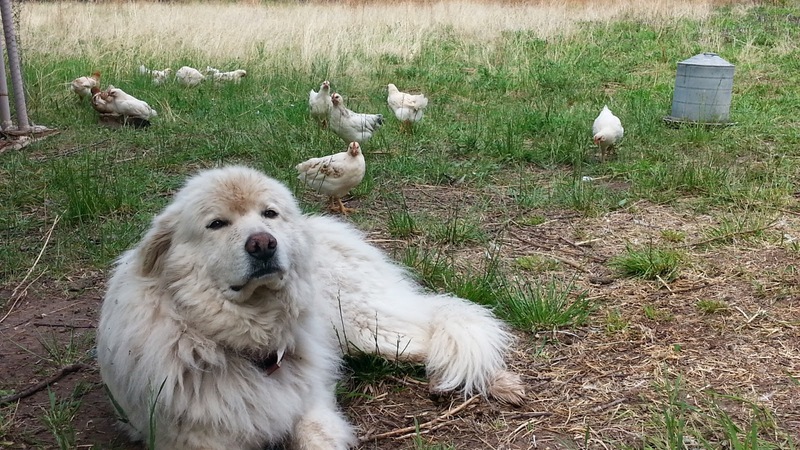 So they all now sleep in the pasture - chicks and the great white dog. At about 6 weeks of age, chicks are beginning to fight. They are "straight run" birds, meaning that about half is male and the other half is female. The males have territorial disputes and it is clear that keeping them in a chicken tractor is no longer possible. They will terrorize each other. The tractor door is opened, and the birds are promoted to free range on the 1/3 acre fenced pasture. The dog is there to keep hawks and ravens away. Though he is not aware of this job, the predators back away, assuming an encounter with him is not worth the risk. And the rest of the summer shall go on, with chicks grazing grass, alfalfa, clovers and other plants at this diverse pasture, catching flies and grasshoppers, finding an occasional earthworm. They are growing into fine organic meat birds. Come fall, harvest time arrives, and birds will become our food. But that is still a few months away. 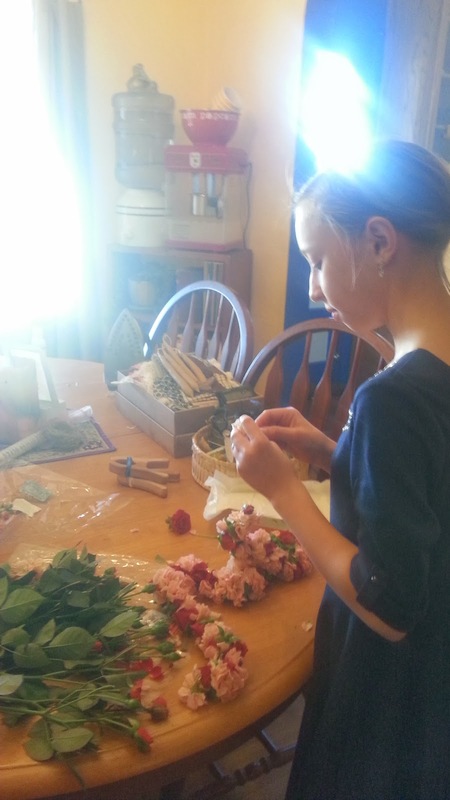 - consider working with heirloom breeds only. They are more predator alert, faster and healtier. - diversity is everything, when it comes to pasture management. Plant things that will offer a range of forage options. 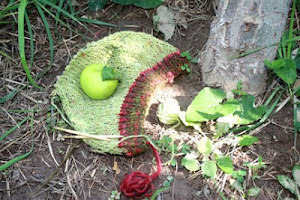 In general fallen berries and seeds from trees and shrubs make a good forage supplement. And alfalfa and clovers offer more protein to your birds than many other plants. Tree logs will host insects, which in turn make a very good snack for your birds. - chickens are forest birds, in their ancestral memory, and when it comes to their preferences, they will seek cover and avoid open pasture. Plants - trees and shrubs - provide such cover and safety from hawks and ravens. Plant more trees. And don't forget to share your questions and experience here! I am looking forward to hearing from you. February Journey - Life Force is Rising! We are so happy to welcome twin baby boys to our lives, born to my step-daughter on the 8th of this month. I was honored to host her Mother Blessing ceremony - an opportunity to gather women friends and family and acknowledge the blossoming of the mother-to-be, her morphing into a new person. This ceremony seemed so familiar to me, with many of my own women-friends celebrating their own becoming in that way, asking for strength and beauty in the upcoming birth, drawing in the love and support from their women's circle. With song and poetry, with story and crafts, a special day to elevate and behold the expecting mother. For my dear step-daughter circle of friends that expression was not so-familiar yet became an opportunity to offer an afternoon of something very sweet and supportive. We were blessed with the presence of the 12-year old niece, and a beloved Aunt came for the day too. With candles, flowers, gorgeous silk outfits, hair brushing and rose petal foot bath we were enjoying the day of anticipation, the day when the Mother-to-be was still alone yet holding the life within. She was like the Sun and the Moon, when she entered the room in her glow, in her lei. Today she is nursing and dreaming, and sleeping and gazing at her little ones. She got two sweet peas in a pod, one is smaller and one is bigger - two boys who are still only few days old! "Monday is rice day" - a statement familiar to many Waldorf homes, where families attempt to craft and follow rhythmical life. Following a rhythm is not only something that parents of young children discover, often with initial dismay ("Too boring!") and later with firmness and comfort ("Today is our park day!"). 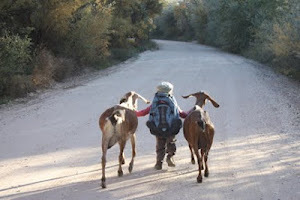 Rhythmical life naturally evolves around animals or farm activities - rhythmical life is synonymous with engaged life. Seasonal rhythms lead us through the cycles of inhale (winter) and exhale (summer), stillness (Winter Solstice) and expansion (Summer Solstice), through breathing in of the late fall, and breathing out with excitement, anticipation, tender joy of spring. The dial of the year must go through the incredible stillness of Christmastide, emerging with new energy of resolutions, year planning and quickening of pace that follows return of sun light in the early days of January. 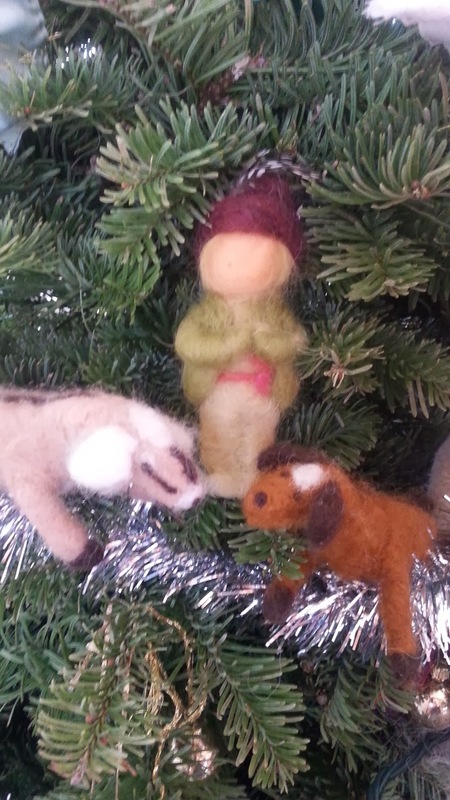 The sweetness of felted creatures on the fir tree - animals and fairy folk gathered to celebrate the dark of the year. Hiding in the green fuzziness, picking out of the deep nest of fir branches they go from the Christmas tree back to our nature table, to the fairy tale basket, to the pretend farm. Stillness is something that is very hard for many of us to embrace or practice. Often we wish for it, search for it but still fail to create space for stillness in our busy fast-paced lives. Stillness of quiet wonder, observation, inhale. The earth around us is asleep in December - the days are short, nights are long, and the life force of the world is being drawn in, inhaled by the earth - into its depth. Tree sap has drained to the roots, creatures are hibernating, leaves returned to the ground to cover it with a soft blanket and to give back nutrients and organic matter that was previously held high on branches. The winds blow low now. They carry snow, leaves. The movement of living things are inward, towards containment. That observation of the living world is something to learn from - and use as a guide both in our own lives and in our work on the land, with living things and other beings.